Tibble Fork Reservoir is a small but beautiful little reservoir located in American Fork Canyon, north of Mount Timpanogos in the Wasatch Front. It is located at the point where glaciers extended furthest south in American Fork Canyon. At this point the wide canyon cut by glaciers narrows to a steep "V" profile. The view from the reservoir of the north end of Mount Timpanogos is quite spectacular, and Tibble Fork is a popular trailhead	for climbing Box Elder Peak. Created in 1966 by the construction of an earth-fill dam. The reservoir shoreline is owned by the Uinta National Forest, and public access is unrestricted. 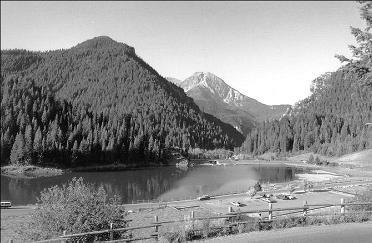 Tibble Fork is managed by the DWR as a put-and-take reservoir. It is stocked each year with catchable rainbows, and most are caught each year. It also has a small resient population of brown trout, with an occasional brook trout showing up as well. Fishing with power bait or worms is often a good bet here. Casting small spinners or spoons, or a fly behind a clear plastic bubble can be effective too, especially in the early morning or late evening.